Pours at La Paulée. Photo by Ed Anderson. San Francisco Travel, Visit Napa Valley, and Great Wine Capitals have partnered to bring an ~INTERNATIONAL WINE TASTING~ to the City View at Metreon on Monday November 4th from 6pm-8pm. The tasting includes wines from nine different international regions (Bordeaux, Rioja, Mendoza, and Chianti, to name a few), plus a selection from the Napa Valley. The full list of regions and producers can be found here, along with some specific wines to keep an eye out for. Look for some bites too. Tickets are $75 for one person or $100 for two (that’s $50 in savings, so grab a friend!). 135 4th St. at Mission. Burgundy lovers, grab your tickets now for this La Paulée kickoff event (and it’s one you can probably afford): La Paulée Off-Grid: A Tasting of Burgundy’s Hidden Gems. On Wednesday November 6th, local SF sommeliers (Josiah Baldivino of Michael Mina, Ian Burrows of Atelier Crenn, Casey Doolin of Park Tavern, Christopher Gaither of Gary Danko, Josh Thomas of Prospect, and John Vuong of Ame) and La Paulée are partnering up to pour great finds from all over Burgundy, including Beaujolais, Mâcon, the Côte Chalonnaise, the Côte-d’Or, and Chablis. There will also be food from The Slanted Door and Piperade, a selection of cheese from Andante Dairy, and charcuterie from Del Monte Meat. 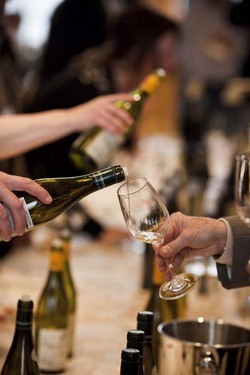 The walk-around tasting event is from 4pm-7pm at ~BLUXOME WINERY~; $75. 53 Bluxome St. at 4th St.
On Sunday October 27th, ~BAYWOLF~ is hosting a dinner featuring Hungarian wines and dishes (look for wines from Blue Danube Wines and Paul Marcus). The dinner features five courses and six pours (here’s the menu); $68, plus tax and gratuity. 6:30pm. 3853 Piedmont Ave. at Rio Vista, Oakland, 510-655-6004.